This isn't the type of fab finds post I envisioned, but a Chicago girl needs a proper winter coat, especially when her job involves spending some time outdoors this winter. Cringe. Normally about this time each year, just pre-Christmas shopping I find myself "needing" numerous things: holiday party outfits, shoes, and makeup. Yes, I end up going on a mini shopping spree for myself before the Holidays. You know you do it too. Actually you probably don't, but hey, whatever. This year, instead of dresses, pumps and sparkles, I found myself needing some down. The goose kind that comes wrapped in a swishy, puffy, marshmallow coat, which I have basically despised since their creation. Okay, I would have preferred to be shopping for the aforementioned, but I need to prioritize. I think most down coats, no matter the details just look ridiculous. But I don't deny their warmth. I had been scouring my go-to spots for a bargain deal on a coat - TJ Maxx, Marshalls, Nordstrom Rack - no dice. Too big. Too small. Too puffy. Too thin. Too ugly. So I finally sucked it up and went to Macy's since I happened to be across the street. And I found and purchased the Laundry by Shelli Segal coat above after much contemplation. I'm not in love with it or anything, but I like that it is long and belted and topped with a faux fur hood. 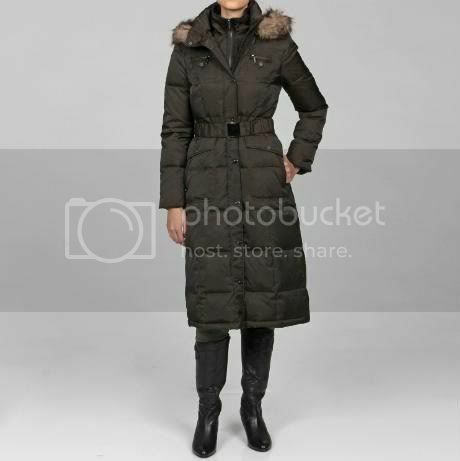 Then I came home and stupidly (or brilliantly) googled the coat and found the same one on Overstock.com for $35 less. After a supposed 60% off at Macy's. After hemming and hawing, you better believe I ordered that bad boy and am returning the original model to Macy's. I can't believe I forgot about the internets. Looks like I was able to get a bargain after all! And I won't be as angry when the first real snow rolls around. No rush.